Sharon Keely, left, of Dublin, watches as participants march up Fifth Avenue during the St. Patrick's Day Parade, March 16, 2019, in New York. 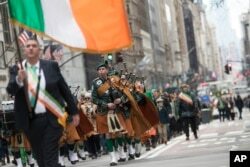 Bagpipers march up Fifth Avenue during the St. Patrick's Day Parade, March 16, 2019, in New York. Members of the Georgia Southern University Army ROTC Eagle Battalion march in the 195-year-old Savannah St. Patrick's Day Parade, March 16, 2019, in Savannah, Ga.
Joey Homans holds his 3-month-old granddaughter Caroline Homans in one hand and a beer in the other before the start of the Savannah St. Patrick's Day parade, March 16, 2019, in Savannah, Ga.